BLOG BOOK TOUR HAS STARTED! | Learning Matters! BLOG BOOK TOUR HAS STARTED! Woohoo! 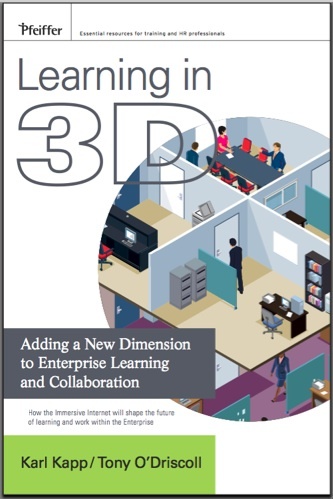 Today marks the beginning of a 30+ stop blog book tour for our book Learning in 3D: Adding a New Dimension to Enterprise Learning and Collaboration. Below are the tour dates and “stop” locations. During the Blog Book tour, I will be limiting posts on Learning Matters to Learning in 3D Nuggets, the rest of my blogging time will be spent I posting on the the blogs listed below. The tour will last into February and promises to be a lot of fun. During the tour, the participating blogs will post interviews, stories, reactions, insights, related stories and even reviews of Learning in 3D. Enjoy all the postings and you can even read the some of the book for yourself. Read it and enter into the conversation or, if you just have an opinion or thought on the topic go ahead and add a comment…have fun following the tour. Also, if you leave a comment on every blog stop on the tour, you’ll receive a Prize. You will receive a whitepaper written by myself and co-author Tony O’Driscoll on where we think 3D Virtual Immersive Environments are on the technology hype cycle. Please enjoy the tour, the idea is to build a great discussion around the concepts in the book and to bring thinking about 3D virtual worlds for learning and collaboration into the forefront of discussions in the e-learning space. Also, please join the Facebook fan page for the book using the badge below. If you would like to purchase the book, you can receive a 20% discount directly from the publisher. Go to the publisher’s web site for Learning in 3D and then go to the Shopping Cart and type in the code L3D1. You can read Chapter One of the book to get a sense of what we will be discussing throughout the book. Day One: 01/11/10 ProtonMedia’s Blog (Ron Burns, CEO of ProtonMedia wrote the forward of the book so it makes the most sense to have him be the first stop on our blog book tour. Check it out. Day Three: 01/13/10 Clark Quinn of Quinnovation will have a stop at his blog Learnlets. Day Four: 01/14/10 Erica Driver on the ThinkBalm blog. Day Five: 01/15/10 Rich Mesch at Performance Development Group’s Performance Punctuated blog. Day Six: 01/18/10 Jane Bozarth at The Bozarth Zone. Day Seven: 01/19/10 Mark Viquesney at the TechSpectives Blog which is an online community dedicated to the latest topics in technology and education. Day Eight: 01/20/10 Rupa Rajagopalan at The Writer’s Gateway. Day Nine: 01/21/10 Brent Schlenker’s blog Corporate eLearning Strategies and Development. Day Twelve: 01/26/10 Mike Qaissaunee’s Frequently Asked Q. Day Thirteen: 01/27/10 Tom Haskin at his blog Growing, Changing, Learning, Creating. Day Fourteen: 01/28/10 Janet Clarey who has a Brandon Hall Research Blog. Day Fifteen: 01/29/10 Cammy Bean’s blog Learning Visions. **Special Saturday (01/30/10) post by Stan Yann at The Ignorant Immigrant. **Special Guest blog post by Mark Copeman at Being Smarter discussing the book tour itself. Day Eighteen 02/03/10 Bart Pursel at Virtual Learning Worlds. Day Nineteen 02/04/10 Clive Shepherd at Clive on Learning. Day Twenty 02/05/10 Tom Werner who has a Brandon Hall Research blog. Day Twenty-One 02/08/10 John Rice at the Educational Games Research blog. Day Twenty-Four 02/11/10 Mark Oehlert at e-Clippings (Learning as Art). Day Twenty-Five 02/12/10 eLearn Magazine will have a review of the book. Day Twenty-Six 02/15/10 Chris Brannigan at Thinking Worlds blog. Day Twenty-Seven 02/16/10 Brian Miller at his blog Cognitive Technologies. Day Twenty-Eight 02/17/10 Roland Legrand at Mixed Realities. Day Twenty-Nine 02/18/10 Robyn DeFelice of DishingDesign. Day Thirty 02/19/10 Randy Hinrichs Reflections on Virtual Worlds. ***With special guest blog this week by Jay Cross. So there you have the great list of tour stops, please join the tour and continue the discussion of Virtual Immersive Environments for Learning and Collaboration and check out the book’s web site at Learning in 3D.